Those words seemed to echo out of a distant past ahead of U.S. President Barack Obama’s visit to Vietnam, a country with which the United States now maintains good relations as well as important trade ties. When Country Joe McDonald sang his anti-Vietnam war protest song, “I Feel Like I’m Fixin’ to Die Rag”, at the Woodstock Festival in upstate New York in August 1969, it drew loud cheers and soon became one of the main anthems of the anti-war movement. McDonald sang it again in April before an audience at the LBJ (Lyndon Baines Johnson) Presidential Library in Austin, Texas, that included many people who had fought in Vietnam as well as many who had opposed the war. The singer, who served in the U.S. Navy in the early 1960’s but never went to Vietnam, said he was pleased when he found out that many U.S. soldiers fighting in that war used to listen to the song. More than 40 years after it ended, the war in Vietnam, and America’s role in it, continue to provoke bitter debate, especially among those who fought in it. Among Vietnam veterans there are mixed feelings about whether the war was justified and winnable, along with a lot of hurt and confusion over an event that drastically changed their lives. Among them is Kerry Orr, who was wounded in 1969, went home to recover and then several years later saw news reports of the North Vietnamese victory. That sentiment is even more bitter among former South Vietnamese soldiers such Captain Michael Do. Under the peace agreement signed in Paris in January 1973, the United States agreed to pull out its troops as long as the North Vietnamese did not invade the south. Do, who later spent time in a concentration camp, said the communists were supported by China and Russia, while U.S. aid to South Vietnam was drastically reduced. “We didn’t have ammunition,” he remembers. One of the men responsible for U.S. policy at that time was former Secretary of State Henry Kissinger, who won a Nobel Prize for his part in negotiating an end to U.S. involvement in the war. Many critics say Kissinger committed war crimes by advising President Richard Nixon to bomb Vietnam’s neutral neighbor, Cambodia. In his appearance, Kissinger said that policy was justified by the four divisions the North Vietnamese army sent into Cambodia. As one of the soldiers put at risk by those enemy troops, veteran Orr does not understand why Kissinger’s policy is even questioned. Many other veterans of the war attending the conference, including U.S. Secretary of State John Kerry, take a different view. He and many others who fought in the conflict came to believe U.S. war efforts were counterproductive. Government documents from the 1960s and 1970s show that policymakers knew that Vietnam was a morass even as they escalated U.S. involvement, author Robert Schenkkan said. “The historical record is pretty substantial by this point that the idea of a military victory, given the circumstances, the political and social circumstances of the time, was not in the cards,” Schenkkan said. He and other critics of the U.S. war effort say U.S. soldiers were told they were fighting communism, but Vietnamese nationalists saw them as foreign invaders. “We were not fighting the war we thought we were fighting,” Schenkkan said. The conflict became more complicated after it turned into a Cold War proxy fight. Bryan Chu, who fled Vietnam with his family after the communist takeover of Saigon in 1975, believes U.S. involvement made the war bigger. 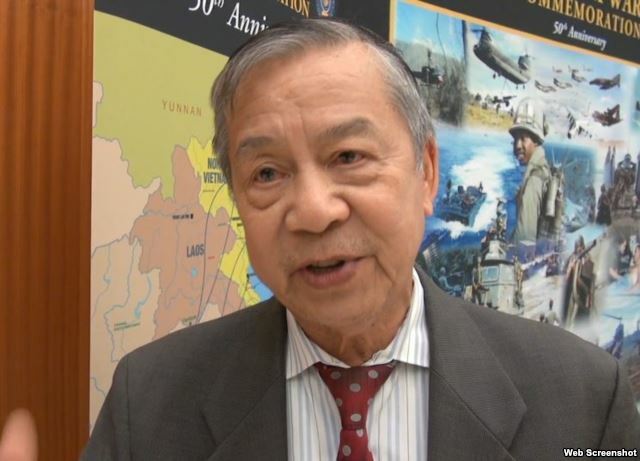 “When the U.S. started sending troops to Vietnam, it escalated the war into the war between China and the United States, between the Soviet Union and the United States,” Chu said. The Vietnam War Summit was held in the presidential library of the man mostly responsible for escalating U.S. involvement in the conflict, Lyndon Baines Johnson. His younger daughter, Luci Baines Johnson, was then married to Patrick Nugent, a soldier serving in Vietnam. Nugent’s brother was also serving in Vietnam. The president’s older daughter, Lynda Bird Johnson, married Charles Robb, a Marine serving in combat. The sisters took the protests outside the White House personally. 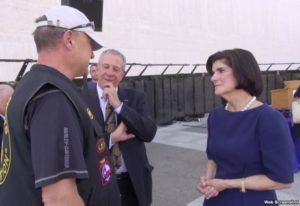 “When we heard those chants of ‘Hey, hey, LBJ, how many boys did you kill today?’ we knew that one of those boys could be my husband or my brothers-in-law and so the men and women who were in Vietnam were family to us,” Luci Baines Johnson told VOA. She said her father tried to find an honorable way out of the war after announcing he would not run for re-election in March 1968. “Nothing did he want more than to bring those brave and honorable and good men and women safely home,” she said. Luci Baines Johnson believes bringing opponents of the war together with former soldiers and policymakers at the summit in April contributed to healing and understanding. Americans born since 1975 have no such visceral connection to the war that divided the United States, but they do view it in terms of more recent overseas military operations in Iraq and Afghanistan. President Obama’s trip to Vietnam demonstrates the healing of relations between nations that can come despite a bitter conflict that claimed thousands of lives on both sides.